Modern defences are highly organised. But by bringing players “round the corner” fast and late, you can spring a sudden advantage in attacking numbers in the desired direction of play. Recycling players swiftly and “round the corner” from the ruck can create overlap and mismatch opportunities in attack. But it requires quick, efficient technique and fast realignment. Put three pairs of defenders in each corridor. Adjust the widths of the corridors to suit your players. Play starts with the 9 feeding the first attacking pod (three players), who can run/pass/play up to the first defenders before setting up a clean ruck. The ball carrier goes to ground on being touched and the other players clear the defenders (who are passive). 9 passes to the next group coming around the corner. These players need to time their runs and adjust their angles accordingly. So, attack Pod 2 has to get round the corner into position ready to receive the ball and play towards Defence Pod 2. Use touch tackles and uncontested rucks. The second pod repeat what the first pod did. The first pod recycle themselves to be ready for the next pass. Develop with full contact, adding players and allowing the 9 to run with the ball. Low into contact and move forward. Calm and efficient ball placement. Immediate tight cleanout through players staying low and with backs parallel to the touchline. 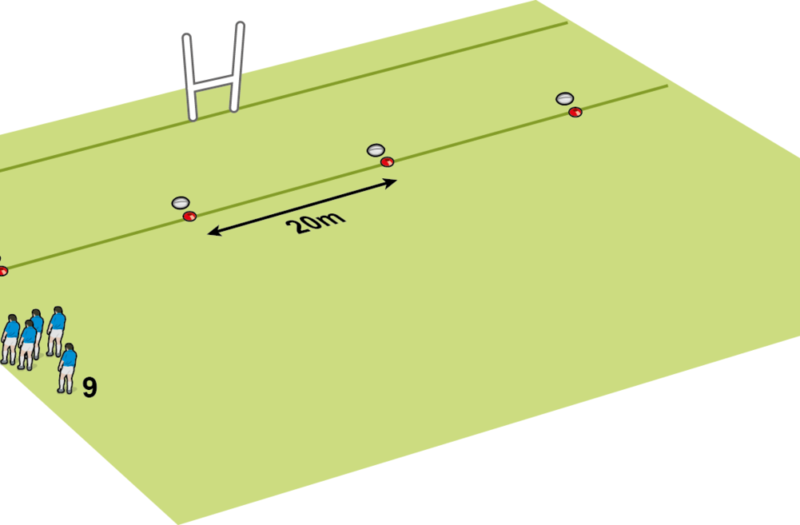 Next pod runs an arc to receive the ball running straight, not sideways.